02.26.2003 - An orb by any other name . . .
An orb by any other name . . . This NASA illustration compares the sizes of Earth, its moon, Pluto, and Quaoar, a recently discovered Kuiper Belt Object - and the largest of the 600-some trans-Neptunian bodies so named, all of whose orbits are dominated by that planet. Depending on which astronomer you ask, there are one, two, or three planets in this image. 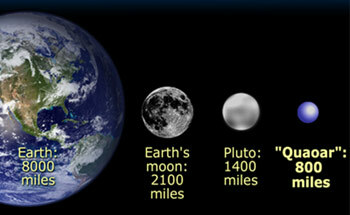 While some would deny even Pluto that title, others would include Quaoar and other extremely large Kuiper Belt Objects. Ask any kid how many planets are in our solar system, and you’ll get a firm answer: nine. But knock on a few doors in Berkeley’s astronomy department, and you’ll hear, amid the hemming and hawing, a whole range of numbers. Professor Gibor Basri, who plans soon to propose a formal definition of a planet to the international body that names astronomical objects, argues that there are at least 14 planets, and perhaps as many as 20. To the well-known list of nine he adds several large asteroids (such as Vesta, Pallus, and Ceres) and more distant objects from the rocky swarm called the Kuiper Belt circling beyond the orbit of Neptune. Professor Imke de Pater and Assistant Professor Eugene Chiang, on the other hand, toss out Pluto without a backward glance. It’s just a big rock, they say, a former member of the Kuiper Belt, puppy-dogging Neptune around the solar system. Not so fast, says Professor Alex Filippenko. The International Astronomical Union (IAU), which rules on names for astronomical bodies, has officially said that Pluto remains a planet, at least for the time being. Thus, officially, there are nine. Professor Geoffrey Marcy and research astronomer Debra Fischer, both “planet hunters” within the department, also prefer to keep the number at nine, noting that the sun, though it probably had 12 or 14 planets in the past, will in five billion years probably lose Mercury and Pluto, bringing the count down to seven. This difference of opinion within the astronomy department is part of a larger debate in the astronomical community over what constitutes a planet. Most authorities, including the IAU (which has sidestepped any formal definition), agree that planets should be orbiting a star — or more precisely, an object that is big enough to ignite hydrogen fusion in its core (what Basri calls a fusor). The IAU’s Working Group on Extra-Solar Planets also excludes anything, like a star, that is big enough to manage core fusion itself. The consensus thus excludes moons, even those such as Ganymede, which is almost as large as Mars but which happens to be orbiting the planet Jupiter rather than a star. The definition also excludes failed stars called brown dwarfs — the focus of Basri’s research — which are too small to be stars but too big to be planets. Basri, who focuses on mass as a way to distinguish between planets and non-planets, proposes a natural upper limit for a “planetary mass object” (aka “planemo”) of about 13 times the mass of Jupiter, or about 4,000 Earths. At this size, gravity will cause an object to give off heat, as happens with Jupiter, but the pressure at the core is a bit too cool to fuse the element easiest to fuse, deuterium or heavy hydrogen. Because anything bigger, including stars and brown dwarfs, is able to fuse deuterium, Basri argues that it makes sense to define a planemo as an object too small to achieve any fusion. The lower limit to the mass of a planemo, Basri says, would be a body large enough for self-gravity to squash it into a round shape. On average, that would be about 700 kilometers in diameter – a limit that excludes all but a few asteroids and KBOs, most of which bear a resemblance to potatoes. Basri then throws in the other traditional property of planets to reach a final definition: a planet is a planemo orbiting a fusor. “If you take this definition,” he says, “you don’t have any trouble what to call these objects,” including many of the new extrasolar planets that Geoff Marcy and Debra Fischer are discovering. Marcy disagrees. In his search for planets around other stars — he and his colleagues have found about two-thirds of all known extrasolar planets — he has come across planet systems that aren’t so neat. Two years ago, his team discovered two bodies orbiting the star HD168443 — one with a mass about 7.6 times that of Jupiter, and one 17 times Jupiter. Basri would call this a planetary system with one large gas planet and one brown dwarf companion — sort of a failed binary star system, where one “star” wasn’t big enough to make the grade. Marcy’s not so sure. He and Fischer believe that consideration should be given to how an object formed, with the name planet reserved for objects forming in accretion disks around a star. In the early dust-and-gas cloud from which stars form, fluffy dust bunnies coalesce into bigger dust bunnies, until they’re big enough for their own gravity to actively sweep in even more stuff. Anything that forms this way around a star should be called a planet, they argue. Stars and brown dwarfs form differently, in the middle of a swirling nebula, thus providing a way to differentiate planets from the rest. Imke de Pater, who uses both radio telescopes and optical telescopes to study planets such as Jupiter and Neptune, as well as the volcanic activity on Jupiter’s moon Io, also thinks that how a body forms should not make a difference in deciding whether a body is a planet. Eugene Chiang, a new member of Marcy’s Center for Integrative Planetary Studies, knows these swarms well. He’s part of a national team called the Deep Ecliptic Survey that is scanning the plane of the solar system in search of as many Kuiper Belt Objects as it can find. They’ve discovered some 250 since 1998, bringing the total known KBOs to about 600, all swarming beyond Neptune’s orbit, 30 times farther from the sun than Earth. Pluto, Chiang asserts, is the largest of the Kuiper Belt objects, and its orbit, like that of all the KBOs, is dominated by Neptune. In fact, it orbits in lockstep with Neptune: Pluto goes around the sun twice for every three Neptune orbits. A large class of such objects in the Kuiper Belt has been dubbed Plutinos because they also inhabit this so-called 3:2 resonance. Of the 100 KBOs that Chiang has tracked well, 25 percent are in resonant orbits with Neptune. “The asteroid belt is dominated by Jupiter, and the Kuiper Belt is dominated by Neptune,” he says, and objects in neither of these belts should be called planets. In fact, because the Kuiper Belt is the source of many short-period comets that plunge through the interior solar system, Pluto could even be called a comet. Chiang’s interest in the KBOs with resonant orbits comes from his theory that planets migrate inward or outward after their initial formation. The many objects in resonant orbits with Neptune argue that it has migrated outward, he says, shepherding the KBOs with it and locking many into resonances. The theory could explain some of the bizarre planetary systems that Marcy, Fischer, Butler and others have found, in which large gas planets seem to be sitting awfully close to their star. They probably migrated inward because of graviational interactions with a gaseous disk or with other large masses early in their system’s history. Basri still feels that Pluto needs to remain a planet, partly for historical reasons, but primarily because it fits a consistent and reasonable definition of a planetary mass object orbiting a fusor. And if we include Pluto, how can we exclude other Kuiper Belt objects and asteroids that look almost identical? There’s really no difference between Mercury and Ceres, he says, so any consistent definition of a planet would have to include both. He suggests calling the eight undisputed planets “major planets” and the others, including Pluto, “minor planets” — a usage once applied to the asteroids before their numbers skyrocketed. But they’d all still be planets. Basri’s proposed definition means that the number of planets in the solar system will continue to grow as more large objects are discovered in the Kuiper Belt. The Caltech team that discovered the largest known KBO last year — a body half the diameter of Pluto that they named Quaoar (kwah-o-wahr), after a creation force in California Indian mythology — estimates that they “should be able to find 5 to 10 more of these really big Kuiper Belt Objects over the next couple of years, including perhaps a couple [of] ‘super-Plutos,’” according to their website. That means an eventual 25 planets. Someday kids may be stumping their parents with planet names such as Vesta, Quaoar, and Varuna, if not Ixion or Radamanthus. They’ll be around for a while — at least a few billion years — so you might as well get used to them.